Awesome! Finally I get to see a view of a contorted skull with skewed ram horns from above!!!!!! Imagine the artist's face when a guy walks up and says, "Yeah, so, uh, I want a half lizard, half human skull... with ram horns." 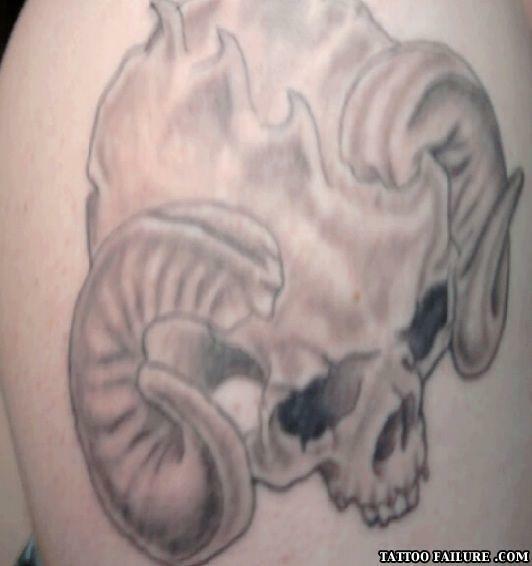 The horns aren't even aligned and there is too much skull on top. Bad art. Have a lot of experience with elk penises then commenter??? There seems to be a jawbreaker in the left horn.